Many people hear about bitcoin every day and are intrigued by it, but they don’t actually have an understanding of what it is or how it works. 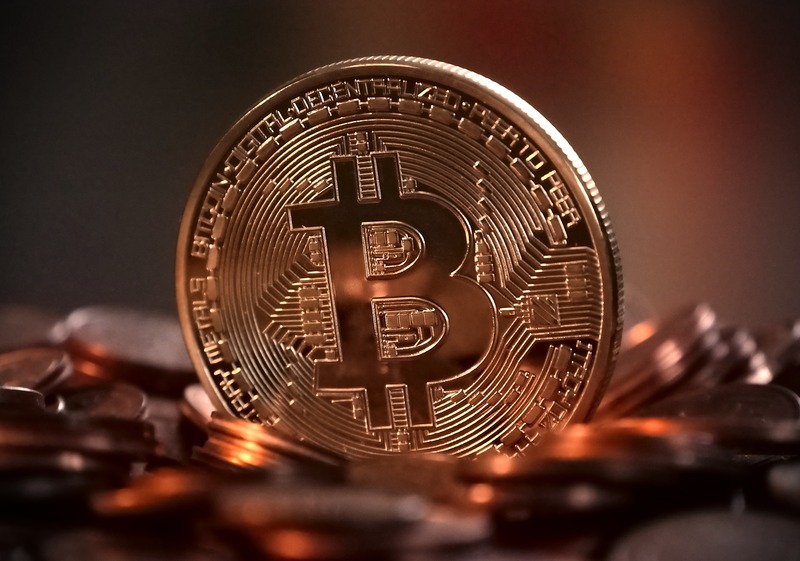 This post is designed to give a basic overview of how payments are processed in the bitcoin ecosystem, and how this differs from the traditional payment process. Let’s say Bill wants to send 0.2 BTC ($1647) to Sally. He logs into his online wallet and types in Sally’s wallet address and the amount of BTC he wants to send. 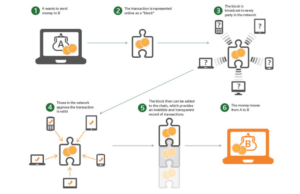 The transaction then gets broadcast onto an online network where it’s grouped into a “block” with other recent transactions. 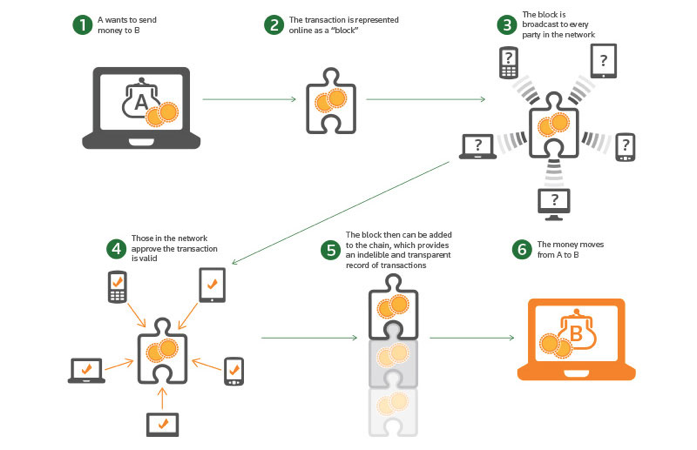 Blocks are connected to one another with chains, and each chain grows to include every transaction that that coin goes through in its lifetime. 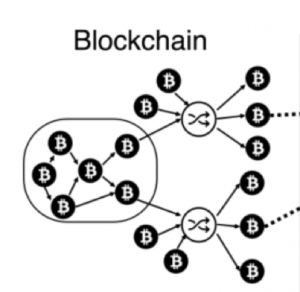 This network of blocks and chains is collectively referred to as the “blockchain”. The blockchain is publicly visible to anyone online. Past transactions on the blockchain are immutable (they can never be changed), but new transactions are being added constantly. These new transactions come about in one of two ways – either from new coins being mined into existence or from existing coins being spent in new ways. The process describing how new coins are mined into existence is complicated, but the end product is essentially the same as printing a brand-new sheet of dollar bills. When a block is broadcast on the network, it stops at a “node” where it’s verified for legitimacy. A transaction is considered legit if it was made between two honest parties (isn’t fraudulent) and isn’t accidentally sent twice (duplicate payment). 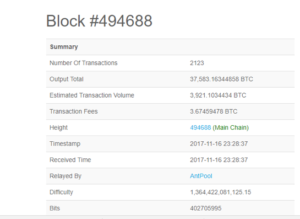 Sample block #494688 is comprised of 2,123 total transactions, with a total value of 37,583 BTC. The block was officially verified on 11/16/17 at 11:28 PM, represented by the “timestamp”. “Antpool” is the miner who verifies all transactions within each block for legitimacy. 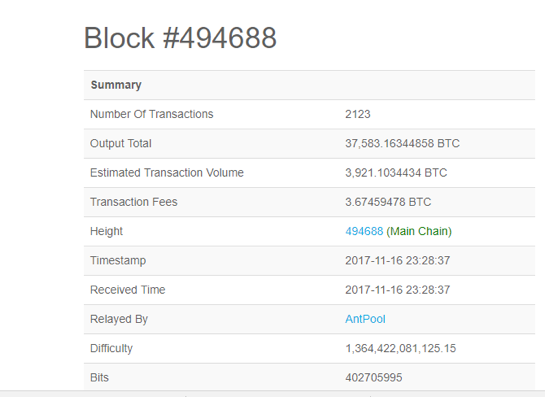 Antpool is paid for his time and effort with a transaction fee of 3.147 BTC. The fee is a % of the total transaction, and the sender can increase the set fee to get his transaction pushed through faster. The “hash” is a series of numbers and characters that serve to identify each block. Each block also includes the hash from the previous block (so you know where the payment came from), and the hash of the following block (so you know where the payment is going). What makes bitcoin different than traditional payments? For one, the blockchain is public, as discussed above. You can see the history of all transactions on the public blockchain. The traditional payment system has no such equivalent. If I send $10 to Ryan, I have no idea what happens to that $10 after I give it to him. Nor do I know where the $10 was before I received it as change in a grocery store transaction last week. I simply know who I got it from and who I gave it to. With bitcoin, you can see every transaction that a coin has been through since it was initially mined. Another point of distinction is that transactions cannot be reversed. Once payments are made, they’re final. The negative of this trust-based system is that coins will be lost forever if they’re sent to the wrong wallet address. And in fact, it’s estimated that up to 25% of the 16.5 billion bitcoin in existence have been permanently lost for this reason. With traditional payments, a transaction can be contested after-the-fact if a mistake was made. 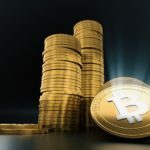 This is advantageous in that money is not lost permanently due to human error, but the downside is that there are costs associated with contesting a transaction. Sign up for our newsletter and follow us to keep up with the latest cryptocurrency news.